This demo is a direct implementation of the 1,000,000 particles demo you can find HERE. 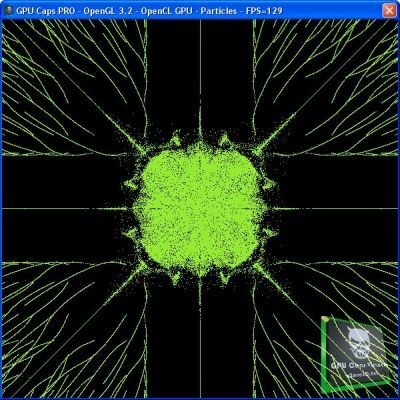 There is a batch file (Start_OpenCL_Particles.bat) in GPU Caps folder that allows you to use either the normal version of the OpenCL kernel or the sine version. You can also change the number of particles (/cl_particles_gpu=2000000 for example). This demo use an interesting feature of OpenCL: GL interoperability or GL Interop. GL Interop is the abilty to communicate between OpenCL and OpenGL: OpenCL can directly update OpenGL buffers without passing via the host app. By default GL Interop is disabled on GPU Caps. To enable it, use this command line parameter: /cl_demo_gl_interop_enabled. When GL Interop is enabled, particles positions are computed by an OpenCL kernel and OpenCL automatically updates an OpenGL VBO with the new positions. 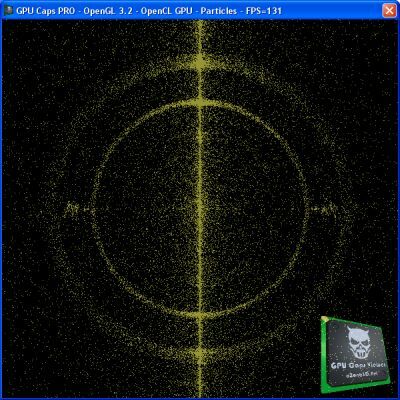 This OpenGL VBO is used for the rendering of particles. When GL Interop is disabled, particles positions are still computed by an OpenCL kernel but this time, all positions are copied (first copy) from OpenCL into a memory buffer in host app memory space. This memory buffer is then used to update (second copy) an OpenGL VBO for particles rendering. GL Interop avoids both extra copies. Currently Radeons don’t support GL Interop due to the lack of cl_khr_gl_sharing extension on AMD’s platform (that’s why GL Interop is disabled by default in GPU Caps). See HERE for more details. But on NVIDIA platform, this extension is supported and the boost of performance is impressive: from 85 FPS to around 200 FPS for the GTX 280! Same thing for the GTS 250. And the GTS 250 is faster than the Radeon HD 5870. Still a story of optimization in my OpenCL for the HD 5000 series or a bug in AMD’s OpenCL implementation? This demo is a direct port of the Ray Traced Quaternion Julia Set sample. The OpenCL kernel is available in the media folder in GPU Caps directory. 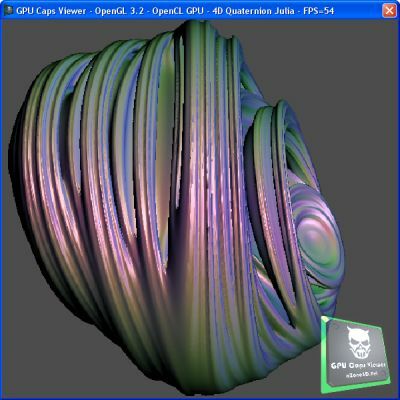 Quaternion Julia Set has the same GL interop option than 1M particles demo. 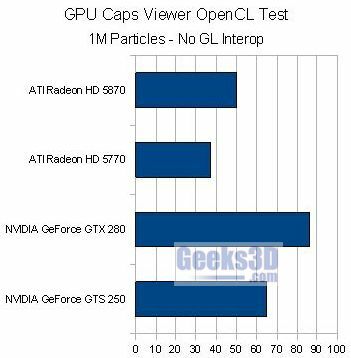 These results reflect the current state of NVIDIA and AMD OpenCL drivers. So I guess that all these results will vary with new ForceWare and Catalyst drivers (and my changes in my OpenCL code 😉 ). With first OpenCL drivers (R190.89 or R195.39), GeForce cards required some optimizations in the OpenCL code to reveal their potential while Radeon cards were not much affected by the optimizations (especially explicit work group size and native_ functions). Now with the latest R195.62, NVIDIA has improved the OpenCL implemetation and things go really better. 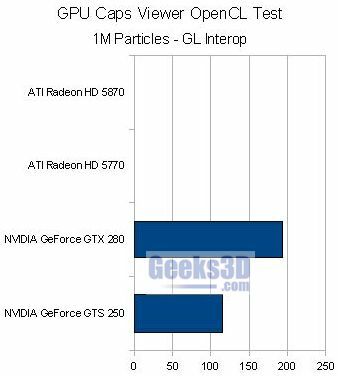 But there are still some problems like a GTS 250 faster than a GTX 280 in some tests or no GL Interop support in AMD platform. I’ll do again a benchmark session when OpenCL drivers will be more stable and, above all, when AMD will properly support OpenCL (GL Interop, no need to install the ATI Stream SDK). 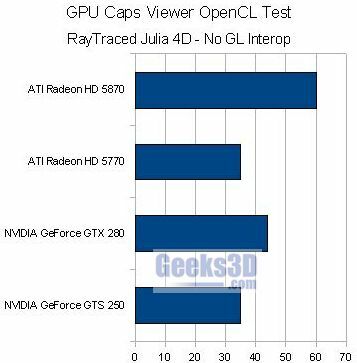 And with NVIDIA’s GT100 that should be available soon, new OpenCL tests will be very interesting. So stay tuned! Don’t hesitate to post your remarks or interpretations of these results. I bought a GT240 yesterday for game dev. Nvidia is taking too long time for me. This shows nVidia is much mature than ATI when it comes to gpgpu. Fermi is not here yet and GT200 is comparable to Radeon 5000. During my tests, ati’s driver has a lot of issues. Now I am using GTX 280 and I am happy. No bugs in driver and I can use linux much safer and bug free. Is this benchmark done again wiht the new SDK and are the results available? I’m searching for the best fitting graphic card for my master thesis with openCL. It should not be too expensive. I thought a HD5870 would be a good choise (~370€), but now I’m not sure any more. Ah, I see the page was updated. Thank you. Can any one do this benchmark with a Nvidia 480GTX? It would be nice to know the result of this card, too. So this is already much faster than the 5870. I need it to implement some sort of ray traycing. Looks like the Nvidia cards are much faster in opencl than the Ati cars…. Can you share me the code about the test2 which i am interested. 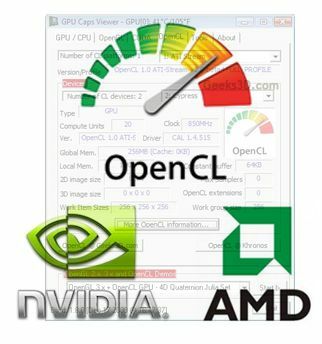 i am a start leaner about the Opencl and i use the GTX250 and NIDIA SDK.|Thanks for you contribution and sharing.